The term “phantom limb” is often thrown around to describe the subtle sensation of something felt but not seen, but few people realize how disorienting the syndrome can be. For more than half of all amputees, phantom limbs can be an uncanny and even painful experience, feeling as though their missing limb is much smaller than it actually was. That can cause added problems when wearing a prosthesis. Instead of sensing their limb as extended by the prosthesis, they feel as though the device just doesn’t match up with their phantom limb. New research out of École polytechnique fédérale de Lausanne (EPFL) in Switzerland might help some amputees better mesh what they see with what they feel. In a paper published recently in the Journal of Neurology, Neurosurgery, and Psychiatry, the researchers show how an amputee’s brain can be tricked into thinking that a prosthetic hand blends with their own body. Rognini’s system works by stimulating a nerve in the subject’s stump, which cause them to feel a tactile sensation on the index finger of the phantom limb. 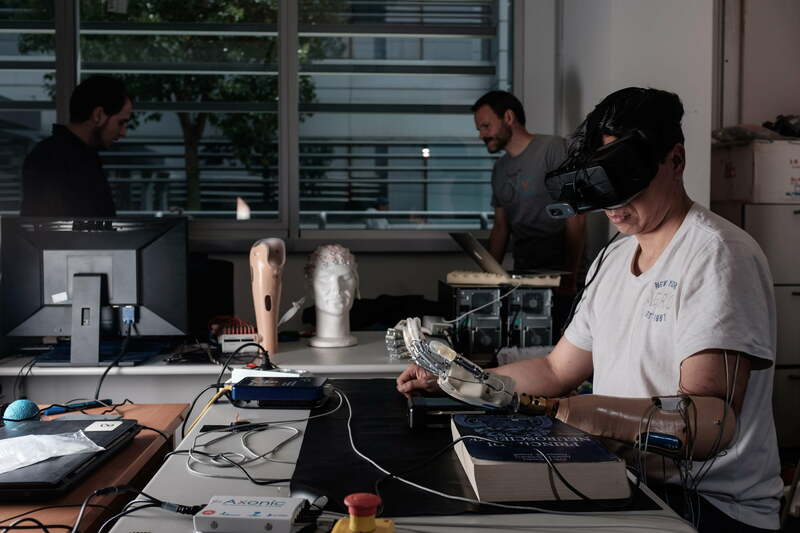 At the same time, the index finger is illuminated on a prosthetic device, depicted to the participant through a virtual reality headset. That combination of vision and tactile sensation seems to congeal the mind, restoring the perception of the phantom limb into the prosthesis. In studies ran on amputees, the feeling of extension of their phantom limb lasted up to 10 minutes after the simulation ended, according to the researchers. The participants said after the study that they felt as though the limb had stretched into the prosthetic device. Moving forward, they want to test whether these effects can be made permanent and whether this system can be used to alleviate or eliminate pain experienced in phantom limbs.